Welcome to the Wiki for the Facebook game "My Vineyard"
The My Vineyard facebook game was shutdown over a year ago… I was sorry to see it go. It looks like there is a company/developer that would like to create a new Vineyard style game. Take a look. 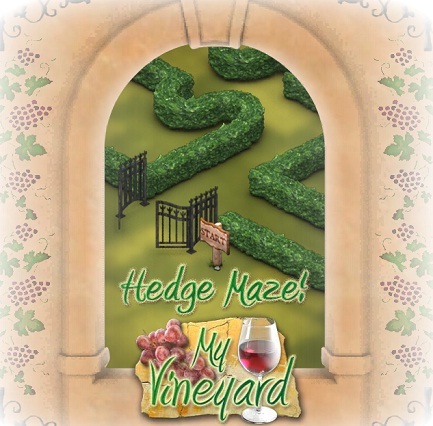 My Vineyard is a popular Facebook game in which players inherit a vineyard. Once in control of their new vineyard, the player must learn to grow grapes, harvest and age them into fine and valuable wines. This is done through learning about the varieties of grapes available to grow, barrels available for aging and variables which can affect the ultimate value and rating of the wine produced. Vineyards can grow and expand as the player levels up and can be upgraded with homes and other decorations. In the course of clearing land for expansion, a secret hidden diary may be found which reveals secrets of the vineyard! A big Thanks and a lot of gratitude go to our previous Admins: Billene Nicol and Adam Wilson. Adam was the brain child to this endeavor and Billene worked tirelessly to get this website up and running!!! She is responsible for much of the content in this site. The Facebook game "My Vineyard" is created and supported by Playdom. This Wiki is an independent endeavor and not supported by Metaplace, Inc or Playdom.